…..and that’s what this project is all about. We’re excited to be launching a crowdfunding campaign in partnership with the RSA to fund our Student Makers’ Festival and Pop Up shop. 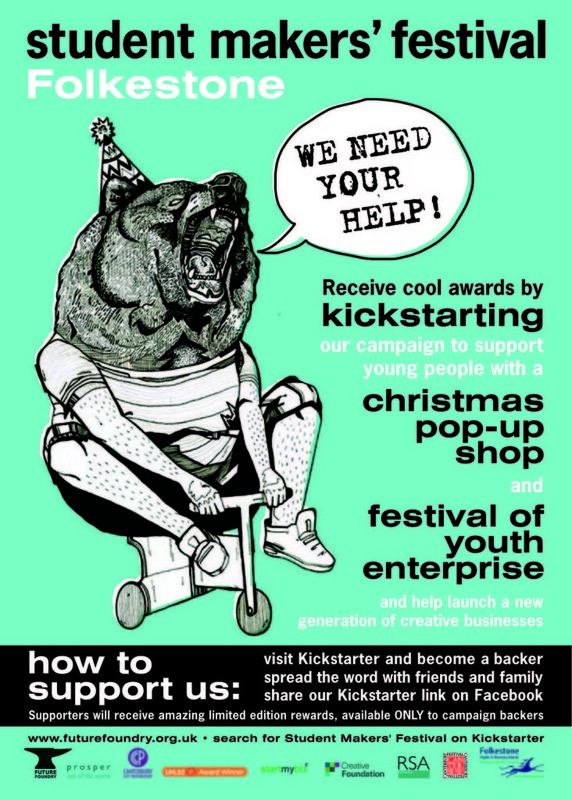 We’ve been given an amazing opportunity- to create a month long Christmas Pop Up Shop and Festival of Youth Enterprise in Folkestone. The Creative Foundation have offered us a beautiful old arcade building for the whole of December and in partnership with Shepway District Council have also given us support towards a programme of inspirational speakers and hands-on public workshops for local young creatives, schools and youth groups. To fit out the production workshop with equipment to enable our young designers to learn, share skills and make their work. To transform this empty building into a fabulous Pop Up Christmas shop and events venue. To create a fantastic launch event to congratulate our young makers and to thank everyone who’s helped us. You can come too! Cool rewards on offer to all our backers – more details coming soon! All of our rewards will be limited edition pieces, designed and made by our talented emerging designers, some are only available to campaign backers! We will give you updates on how our young makers are getting on and we’ll mention you in our Student Makers Thank You Video too!